After a long cold winter there's just something special about the first blooming flowers that greet us in the springtime. After a long, cold and snowy Winter, there are few sights I look forward to more than the first Spring flowers peeking up out of the ground. Their bright green shoots and colorful blooms are a joyous announcement of the approach of Springtime. Ever since I was a child I was excited by the first colors of the season, and today I've been working on adding to and creating more of a Springtime garden at my own house. On this page I'll talk about some of my favorite of these early Spring flowers: the snowdrop, the crocus, the hyacinth and the grape hyacinth. I'll share information on how to plant and care for them in your garden, and also share beautiful art and photography featuring these incredible blooms you can enjoy. 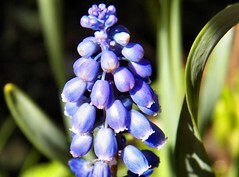 Grape hyacinths in bloom - one of my favorite early Spring flowers. Photo by sockii. One of the earliest flowers for your garden! The Snowdrop, or Galanthus, is a small genus of about 20 bulbous herbaceous plants, the most common being the Galanthus nivalis. 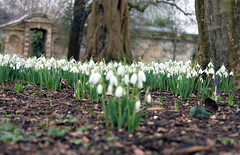 Most Snowdrops technically bloom in Winter, before the vernal equinox, however its small white blooms are taken as a sign of the approaching Springtime. 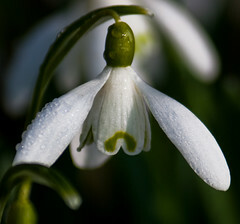 The Snowdrop is native to Europe but has been introduced and naturalized widely around the world. 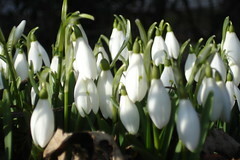 The Snowdrop is a perennial bulb, producing a tiny, delicate white flower. It can propagate well leading to beautiful "carpets" of Snowdrop flowers in gardens and in the wild. 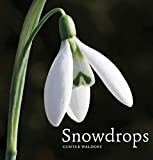 Growing Snowdrops is relatively easy and a wonderful addition to almost any flower garden or landscape. 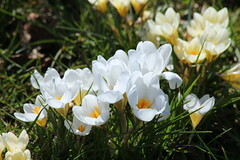 The crocus is one of the most popular early Spring flowers around the world. It is a genus of flowering plants from the iris family, consisting of 90 different perennial species. 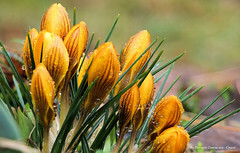 Crocus plants can bloom in Autumn, Winter and Spring however they are most associated with late Winter and early Spring, often one of the first blooming flowers that appear in our gardens. The crocus is a hardy plant that is easy for even beginning gardeners to grow, one that can propagate and spread when naturalized into a grassy area. They come in a variety of different colors from white and yellow to deep, dark purple. Relax and enjoy...in the Polish city of Szczecin as the crocus comes into bloom. Crocus are delightful plants that come to life in the spring when the weather begins to change - even when there is snow still on the ground! 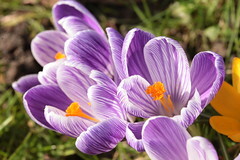 The much-coveted and extremely expensive spice saffron comes from the Crocus sativus flower. It is prized for the beautiful golden color it imparts on food and its unique, delicate flavor which cannot be replicated by any other spice - not even close! You can't make a classic Paella without the saffron. 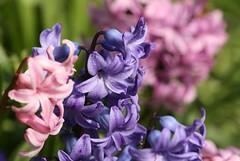 As a child, the Hyacinth was perhaps the flower I loved the most in my mother's garden. I loved their large spikes of colorful blooms with their wonderful fragrance that would fill the air, even just as you walked by them. When I bought my own home, the hyacinth was one of the first flowers I bought for my own garden as well. The Hyacinth is often associated with the idea of "rebirth", which of course makes them so perfect for an early Spring garden when new life is coming out of the dormancy of Winter. 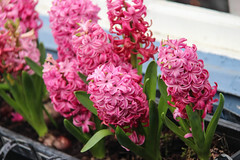 Growing Hyacinths is relatively simple although they do need good drainage and a sunny spot in your garden. They will return to bloom year after year, although the flower spikes may become smaller and thinner as they age. 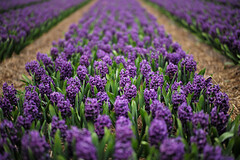 Hyacinths make wonderful cut flowers, as cutting the flowering stem when in bloom will not interfere with the plant returning and blooming the following year. That way you can bring the wonderful fragrance of the Hyacinth into your home, or make for a perfect table decoration for an early Spring celebration. These petite perennials are a common sight in gardens and lawns in early Spring. 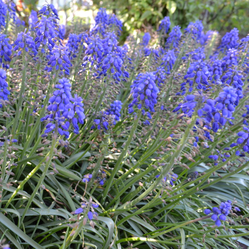 Typically blue in color, their little urn-shaped flowers look like small bunches of grapes and their appearance is somewhat like a miniature version of the common Hyacinth. 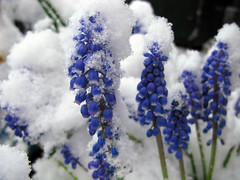 The Grape Hyacinth is another easy to grow bulb, however one should be careful about how rapidly they will spread! They can take over a garden area if left to it, but they are perfect for edges or areas that you would like to naturalize with a spreading carpet of tiny flowers. 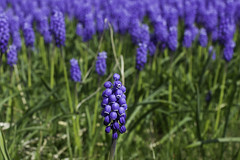 Buy grape hyacinths for your garden in a variety of colors! Which Is Your Favorite of These Four Flowers? Which early spring bloom is your favorite? 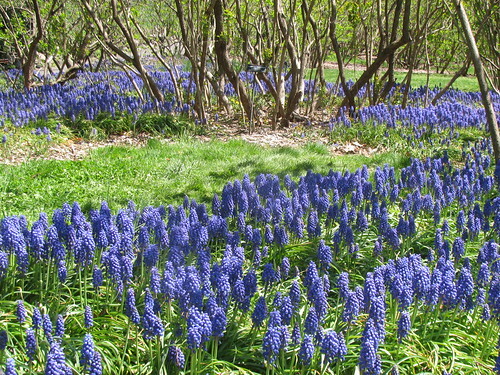 I love all of these spring flowers but I have to say I haven't seen grape hyacinths around these parts. I live in an apartment, so I don't garden, but my sister has every one of these spring flowers. They are just beautiful. Are You A Flower Gardener? The foxglove plant is one of the most striking flowers you can add to your garden. Learn more about the history of the plant as well as how to grow it for yourself. I am, and I love the friendship that flower gardeners share. I have never met a person that gardens who wasn't anxious and proud to share growing tips, plants, flowers and seeds!